I've been aware of Comets On Fire for a long time. I heard their first major album, Field Recordings From The Sun, was an insane ball of distortion unlike much out there. I listened - and recoiled. Devoid of melody and structure (to my ear), the album was, to me, unlistenable - as I told you when I posted "Blue Tomb" a few days ago. That song was from their second album, Blue Cathedral, and when it came out, I heard, "It's just as crazy! But more accessible!" And so it was... by like one iota. "Blue Tomb" and maybe one or two other songs survive in my collection. Then, a few weeks ago, I heard their new new album was coming out. I had to give them credit, "Blue Tomb" was so great that it warranted my checking out their new album - that is, as soon as it comes out in August, you understand. Well, my friends, the poisonous, spiny caterpillar has entered its chrysalis and emerged an unbelievably badass butterly. Gone are the intimidating trappings of a noise band exploring just how noisy noise can be. I direct you to Soft Canyon's Broken Spirit, I Will Mend Your Wings as the only other real example I can think of that creates a sound so completely foreign in time. While the music is not really comparable, both share a love of analog sound and anachronism. I understand Comets On Fire to be insane about their gear, building it themselves or salvaging ancient amps from dust-choked attics of former Red Krayola members. Alas, I can't give you any reference points for what this new album sounds like other than Soft Canyon, and even then, they're only a reference because no one sounds like them any more either. Much more than before, and more than most other bands, Comets On Fire establish an incredible breadth of sounds on the album. The opening track, "Dogwood Rust," is reminiscent of their older albums, but somehow strikes a balance between being more orderly and melodic, and being utterly insane. The catchy retro groove and beautifully clean guitars of "Jaybird" can only be appreciated with close listening, though an occasional blast of noise may startle you out of your seat. And just to show you what they're capable of, what's "Lucifer's Memory" but a piano-led ballad complete with careful songwriting and vocal harmonies! And the wail of guitars distorted beyond recognition somehow jives perfectly with the soulful climax? I won't spoil any more for you, I will just say that this album in only 7 songs encompasses more musical meat than... well, I don't know, but the fact that we're getting things that belong in the wet dreams of Jim Morrison, Lightning Bolt, Dead Meadow, and Wolf Eyes on the same album renders my feeble analogies toothless. I won't delay you any longer. 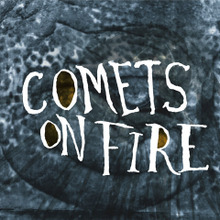 You need this whole album; the time to get into Comets On Fire is NOW. 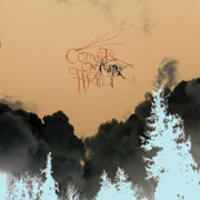 Here's "Dogwood Rust," by Comets On Fire, and here's "Lucifer's Memory" to show their soulful side. 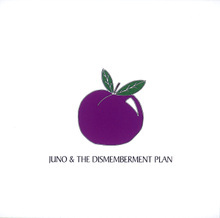 At a used music store maybe 7 years ago, I found a little cd for three dollars, a split between Juno and The Dismemberment Plan with a quaint little illustration of a plum on the cover. I didn't know who either of the bands were at the time (hardly do now, though I know they were no slouches), but the little EP intrigued me - and the price was right - so I bought it. To be honest, I've since lost the thing and don't even remember what 3 of the 4 songs sounded like, but one was good enough that I ripped it even at that tender age and still have it. It's a cover of Jennifer Paige's "Crush," a terrifying house/pop number from 1998, and I'm putting it up here so you can compare. The Dismemberment Plan's take on "Crush" completely flips the style, slowing the tempo to about half speed and making it a minimal, bitter song instead of the bubblegum tornado that was the original. It's really quite an accomplishment; I think you'll like it. Here's "Crush," by The Dismemberment Plan. I had the original too but now I've lost it. If you're curious, I'm sure it's around. It's difficult to juggle intensity and good pacing - if you get one wrong, it messes up the other. Many bands forgo one in order to focus on the other, but a skilful few manage to keep both in full effect. Bands like Kepler, Espers, The For Carnation and Migala keep the intensity high despite their generally slow pacing, and the effect is almost universally good. Now, I'm not talking about just an overextended climax (I'm looking at you, Yanqui U.X.O. ), just keeping your ears pricked because every sound is made important by careful writing, playing, and mixing. Now, I'm not proud of it, but I confess that I was unsure about getting this album because of all the Spanish. Not that I have anything against Spaniards or Mexicans, it's just that I find singing in other languages, Spanish included, to be distracting sometimes. If you share my prejudice, be calmed because there is little or no Spanish actually on the album. The music itself is, if you can picture it, high intensity but low key - a sort of passive-aggressive album. Even when the singer is whispering slowly in his excellent, low voice, you feel like there is a crash of guitars hanging just above your head, ready to drop at any moment. It rarely happens, but the threat feels real nonetheless. The sound is clean and, to my limited knowledge of the man, reminiscient of Ennio Morricone. Songs generaly switch between beautiful but incindiary guitar parts and quiet vocals, sounding like he's dying of a gut shot and telling you of his many regrets. The best example would be "Ciudad del Oeste" and "Aquel Incendio," the central two-part song that spans the entire distance from nearly silent warbling to wailing, distorted crescendo with superb grace. Other songs are notable: the instrumental opening track with its similar building-up of guitars, and "Tiempos de Desastre," a nice do-all song. Some don't fare so well - mainly when the vocalist sings too hard, it throws the whole feel off; his voice sounds much better soft. You'll know right away if this is your scene or not - the organ and guitar establish a sound that is very distinctive and beautiful, if you're into that whole lonely western feel that Morricone and Tulsa Drone love so much to cultivate. In any case, this double song is great no matter what, so enjoy. 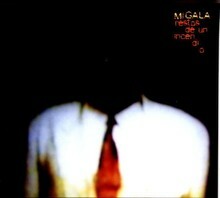 Here's "Ciudad del Oeste," continued in "Aquel Incendio," by Migala. Remember your Speak&Spell? Well, this is what it was doing while you were asleep. While you dreamt of MacGuyver in your bunk bed, your Speak&Spell would sneak out the back door and attend all-night mixers where other devices would drink, carouse, and with luck maybe get a hardware handshake going on - and Farben's Textstar was playing the whole night. Or not. All pretense and fantasy aside, this is a great album of analog electro that works just about anywhere. It's a collection of songs from a series of EPs over the years leading up to Textstar, and while there are certainly different styles present, they are all recognizably Farben. It's good, but as funky electro goes, it's a little too strange to find in a boutique store, and not hip enough to be on the radio. On "Live at the Sierra Tahoe, 1973" and "Beautone," a sound is established that is pretty much unique - repetitive, heavy in the low end, limited samples, lots of analog synth, not an original set of parameters but Farben makes it his own. 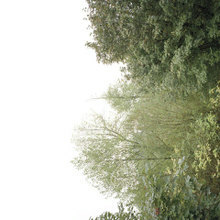 On tracks such as "Bayreuth" he explores more ambient territory, albeit not without a beat. Just throwing in a triple negative there to keep you frosty. Anyway - on "FF" he approaches Daft Punk with a more sampled, poppy sound, and the final track is almost too smooth, at the Kruder & Dorfmeister/Thievery Corporation level though without the emptiness that usually accompanies that kind of music. Textstar is great music and I've had it in rotation for years. As long as you're cool with the general type of music - funky, instrumental, a little repetitive - you'll be good with this. It's excellent and fits almost any occasion, with napping as a possible exception. Give it a shot, and let the electronic burps and synthetic wind take you away. Here's "Live at the Sierra Tahoe, 1973" and here's "FF," by Farben. I'm not going to BS you here. This song is the only one that survived my purge of the album. The fact is that before their current release, which is awesome, these guys were far too noisy for my liking. Their first album was unlistenable for me, and Blue Cathedral had some good tracks but I generally found it unpleasant. This is the major exception - "Blue Tomb" is a fantastic song, and closer to what they're doing right now. It's heavy, it's long, it's noisy, but not too much of any of those. For some reason I always picture a terrible melee with one guy slaughtering hundreds of others. But that's just me. I.. Here's "Blue Tomb," by Comets On Fire. Growing, Jack Rose, and Earth recently toured through Seattle, and I missed their show for some stupid reason. My friend Mike told me afterwards that it was the only show at which he'd ever needed earplugs, and that's saying something because the guy is in a scary noise band. Before that, however, I was intrigued by Growing's name and long tracks (which I hadn't heard at the time), and Mike said to me: "Growing is really...(long pause)...constant." Now that I've listened to them I'm not sure whether I agree or not. Certainly they have drones which continue for long periods, and their songs travels little over their running times, but they're not stationary. The music moves, but slowly and under the surface, currents of melody transparent under the shimmery wall of sound. They're prolific, which makes sense when you hear how much they like their sustain, but they're consistently good - more so than, say, Pelt, who are brilliant at one moment or on one track, then boring or offensively noisy for the rest of the album. If anything, they are about concentration. I don't mean to get all music critic on you, I just think that they're very serious about being fully enveloped in the sound they create. It isn't meant to move you, it is meant to take up your entire aural space and let you drift along inside its sonic womb. The opening track initiates you slowly, giving you ethereal butterfly kisses with the guitar before slowly raising a fluffy curtain of harmony in front of it. It leaves and returns with a sibilant accompaniment that overtakes it - I get an image of a huge whale being engulfed by an immense school of silver fish. "Anaheim II" comes like a slap to the face and stays loud, but isn't a very interesting track, to be honest. The next two tracks, "Epochal Reminiscence" and "Primitive Associations/Great Mass Above" form one huge song more than 30 minutes long. The sound is infinitely thick and hypnotic, the tone changing slowly, aqcuiring later a high, vibrating foresound that connects it with the final track - a peaceful, quiet thing with water sounds and birdsong. I'm giving you a fat track, the second to last, but if you can't deal with it, I wouldn't try the other songs or albums. However, if you are like me and you think it's crazy and beautiful, for gods sake check out the rest. Here's "Epochal Reminiscience," by Growing. Behold! Freed from the dismal fetters of space and bandwidth limits, this blog is now mightier than Hercules. Bounded only by my upload speed (which, alas, is quite low), I now have the ability to provide you with large files I had before only put up with great trepidation. 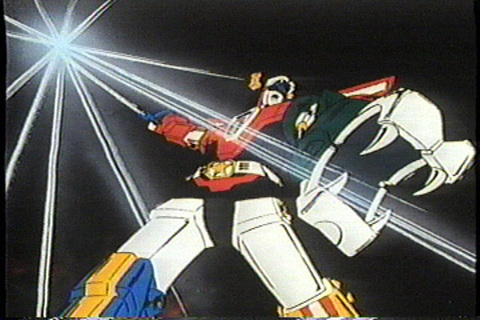 And how awesome is that picture of Voltron?! 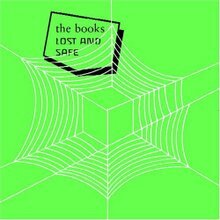 The Books' first album was an enigma - a kinetic, fascinating, and obscure sound collage that lapsed into periods of beauty or total abstraction. Their second album, The Lemon of Pink, was interesting but not as momentous as I wanted it to be. Their latest, Lost and Safe, departs from their sound even further, although it is clear that some of the songs are cruising - it's not as inspired as Thought for Food, but I think that despite the strangeness of hearing actual lyrics and the presence of some bum tracks, it is a great success. The opening track is excellent, though it sounds nothing like a Books song. It's calm and quiet but well-crafted. "Be Good to Them Always" and "Smells Like Content" aren't bad songs certainly, but they are wordy and busy without the awesome spasticity and constant changeup of songs from their first album. "Vogt Dig for Kloppervok" strikes a more even tone, though some may dislike the buzzing, vibrating tone of the singer's voice. "It Never Changes to Stop" is a simpler track but affecting - the samples are more consistent, a guitar lick present throughout the song, both grounding the song and driving it along its course. The thumping buildup of "An Animated Description of Mr. Maps" is good for as long it is instrumental - the lyrics merely complicate it later. The rest of the tracks follow a similar progression - the instrumentation and sampling are faultless, but when the singing comes in, it's a matter of taste whether you like it or not. The Books have changed their sound, and whether you've listened to them before or not, this album deserves a listen. It certainly strikes new chords, but at the risk of alienating their former fans. The singing isn't bad (usually), but it's of an unfamiliar color on the canvas the Books have been painting. Give it a shot, but if you haven't heard these guys before, start with their first album. Here's "A Little Longing Goes Away," and "Vogt Dig for Kloppervogt."